You might recollect I had written an article on Dishman Pharma on 26 July 16. The article was about possible end of correction and start of a new bull run in the stock. "it seems that Dishman Pharma has completed classic correction on monthly chart. Next major resistance is near 165-170. We can expect stock to cross the hurdles this time to break all time high and start its next bull run." Following chart was posted in the article on 26 July. Coming back to current scenario. Charts are indicating that the stock has clearly broken out of its hurdles near 170 and is now trading above all its earlier monthly closing. The stock after reaching the level as indicated by arrow in above chart has come out of the important resistances.While writing this article the price of the stock is around 194. Markets run in cycles of expansion and consolidation. The stock is currently in a expansion phase. There can be possible consolidation or some correction from current level. You are advised to do the due diligence before entering the stock. Disclaimer: The contents produced here are purely for educational purpose. They should not be construed as buy/sell recommendations. I am not a SEBI registered Analyst or Investment Adviser. Readers are advised to consult their Investment adviser before taking any decisions based on above write-up. It has always been tough to decide on entry point in a stock. We know stocks keep giving us entry opportunities to enter. It is up to us where to grab the price. In this article we shall discuss about what are the pros and cons of each of the entry type as mentioned in the title of the article. A stock looks very attractive on charts while moving up. It gives us feeling of making some quick bucks. At the same time a stock moving down is like a bad dream and we do not wish to touch it. However something which is falling means you are getting it at a cheaper price. Here are some characteristics of a breakout. A breakout is an action where stock moves beyond substantial Resistance. A sudden demand is created. Whole world starts buying the stock. There is a sudden jump in the stock price. Long green candles are seen on chart. Volume suddenly increases. In fundamental analysis parlance breakout investing can be compared with 'Growth Investing'. It is like buying something though it is costly, as the demand is still high. When I refer it in context of technical analysis, I mean the stock has already seen a substantial run-up, still I wish to buy it as there is further scope for it to move up. Near Support: Here are some characteristics of a stock being near support. In this case stock is in the process of approaching substantial support. Demand is not evident on chart. Volumes are not indicative. Candlesticks still give no clue about potential future up move. This can be compared with Value investing in fundamental analysis parlance. When I refer it in context of technical analysis, I mean stock has seen a substantial fall and there is no indication of buyers interest in the stock, still I wish to buy it due to its low price and potential up move from the level. Having seen what I mean by Breakout and Near support, now lets try and understand what are the pros and cons of taking each type of entry. We enter during price in momentum. Hence it has higher probability of continuing the upward movement. Less Wait. We don't have to wait for price to start moving in desired direction. Probable time to reach target is less, so some quick bucks can be made. Higher confidence as you are with others who are also buying the stock. You Enter near support and hence the stoploss is very near. Risk is less as you enter near a stoploss. Reward usually has better ratio with Risk. You buy something which is cheap. There is high probability that the institutional investors are buying these levels. Long wait before the price starts moving up as there is high chance that the stock will consolidate near support. Both the cases have some Pros and some Cons. Its an individual's choice which one to enter. Each trader has his way and style of trading. Some like fast results and some other like to have lesser risk. I prefer to have good mix of both the entry types. In my portfolio, I prefer to have around 60% breakouts and 40% entries near support. It has mostly been the case with retail investors / traders that they 'buy' after rally and 'sell' after a fall. In short 'hamesha train chhut jati hai'. It is not a good idea to run behind a price and grab a stock at any 'cost'. Professional traders / investors wait patiently for a stock to arrive at a desired level. It is not advisable to get into a stock at current market price. Instead place an order at an expected level. Retail traders / investors buy at market price because they do not anticipate the levels before the elve reaches. While it is not guaranteed that we shall get all those anticipated levels, there is always a 'chance' we get a huge discounted price. Here are some stocks which we can keep in the watch list for an anticipated fall during current (possible) correction. Market always give us an opportunity to enter, provided we should be ready to grab that opportunity. I have arrived at the levels purely on the basis of chart structure and possible support levels. All these 5 stocks are fundamentally placed at a very strong position, however the prices at current level are not appealing. Markets do what we do not think. So at current level we may feel that the prices which are shown on these charts are too far to reach, however there is always a possibility of getting it. 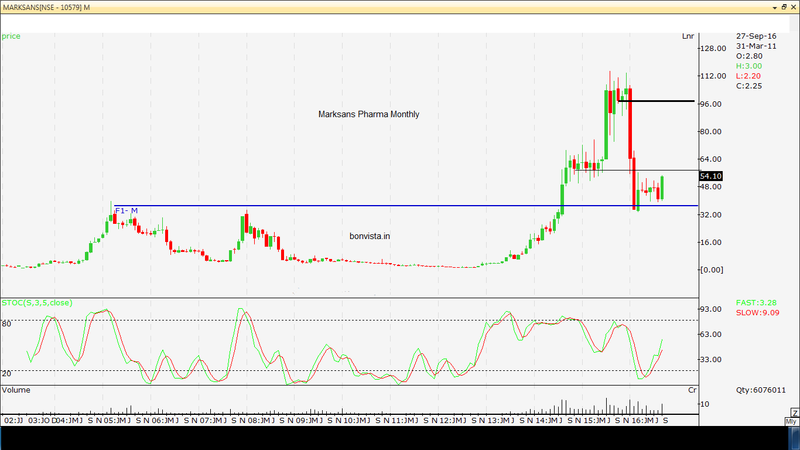 Ajanta pharma broke out of long consolidation during last week of July. That was good price to get into the stock. A strong support emerges near the level of 1700-1650-1565. At 1700 is a discount of 11% from current price. If one gets these levels there is high chance that the stock will resume after testing these levels. One of the dream stocks to be in. While it does not give many opportunities to enter into, we can always anticipate one, instead of entering at high price. First level I shall watch for is 1025 and then 920. These are at a discount of 12% and 21% respectively. After a dream run Tata Motors seem to have made a double top. If it corrects substantially from current level, the support emerges at 470 and then at 425. That's a 14% and 22% respectively. Ultratech Cement experienced one way rally after breaking out of 3330. This kind of rallies are expected to have substantial correction. Lets expect it to reach around 3330 in the days to come. That's a discount of 13.5% from current level. Getting into a stock at right price requires lot of patience. Moreover, you never know whether they will surely get to anticipated price. However, if the stocks reach to those levels you have an attractive prices to enter into with heavy discount without any bargain. There has always been a difference of opinion over methods of analysis in stock markets. These opinions are mostly the extreme thoughts. I feel all these opinions are too extreme to consider. Nothing in this world is fully useless and nothing in the world is perfectly useful. Both Technical Analysis and Fundamental Analysis have their own advantages and disadvantages. It depends on you- which one (method) suits your style of investing / trading. It also depends on your 'type of personality'. It depends on what strengths you have. Take the Brain Test to understand whether you are Left brained or right brained. It depends on whether you are a trader or a investor. It also depends on whether you are short, medium or long term trader/ investor. While there is no substitute to fundamental analysis when it comes to right valuation of a scrip. There is not substitute to technical analysis when it comes to best risk management tool over a short period of time. In fundamental analysis with the help of valuations you can decide how far stock can run in the long term as you can decide whether is stock has very high valuations with the help of ratios like P/E or P/B. On the other hand, with the help of technical analysis you can judge what market is thinking about the stock, whether market is still willing to take the stock to higher price. In short technical analysis tells you about the market sentiments. Frankly I feel Technical Analysis is a misnomer and should be renamed as "Sentimental Analysis". One thing is for sure you can not do the short term trading with the help of Fundamental Analysis. Technical Analysis helps in understanding the short term trend, the momentum, areas where biggies are placing their buy and sell orders, areas where one should exit out of the position if it is not your favour etc. At the same time if you are long term investor there is no alternative than to analyse a company using its fundamentals like balance sheet, P/L, cash flow, management quality, product etc. To conclude, I feel the comparison between the fundamental analysis and technical analysis is baseless. Comparisons have to be apple to apple and not apple to oranges. If you are an Intra-day, Swing or a Positional trader use of Technical Analysis can enhance your chances of winning a trade. It offers you a better risk management tools. It helps you understand markets sentiments. There is also a flip side to it. Some traders fill they will make 'sure' money once they learn the technical analysis. Its not only about learning the technical analysis, its about practising it over a period of time. You can not become a good cricketer just by learning rules of cricket. you have to practice it hard. My Online Interactive Course on Technical Analysis is followed by 6 months of practice sessions and life long support. It clearly spells spade a spade and is not designed to show 'rosy' pictures to traders. I don't believe there exists a formula for success in stock markets. Instead, I believe in strict risk management and hence the course contains ways and means of Risk Management and Money Management other than learning the Technical Analysis.